Well worth a look- even for cowboys! 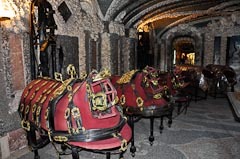 It was very much a privilege the other day when I was able to see in person this magnificent set of harness. I’m not permitted (unfortunately) to divulge the name of owner or the location for security and privacy reasons. Owned today by the same family who originally had it made, this is truly a cherished treasure. 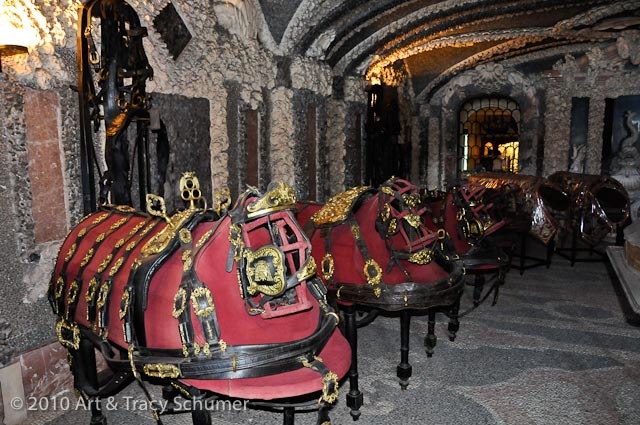 This remarkable set of Full State harness for six horses dates from the late fifteen hundreds and yes, that’s real gold. 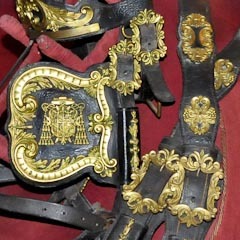 It was used on formal occasions by the Archbishop of Milan. Historically, breast collar harness pre-dates the full collar. The leather is in amazing condition considering it was tanned, cut and sewn over four hundred years ago. The hardware is really beyond description. 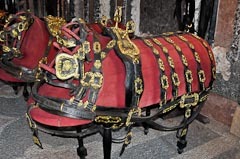 Stored under excellent conditions of low light, medium humidity, cool temperatures and beautifully displayed; It looked like all it would take was for this harness to be carefully fatted and it could go right on a ready team of Lipizzaners. Just a matter of choosing the correct vehicle right? Special thanks goes to David E. Saunders, former head coachman to the Duke of Edinburgh, for lending his vast expertise and identifying this set as “Full State”. So back to the title question; Fit for a King? The answer is “almost”. The red color does denote royalty so perhaps it would be more correct to say that this harness is indeed fit for a royal. Very few of us regular folks can honestly claim royal lineage but for our horses, nobility comes with the DNA. The ancient ancestors of every contemporary breed have direct connections to the highest levels of human society in every culture they originated from. Horses have been adorned with precious metals and gems, prized as the highest measure of wealth and even worshipped for thousands of years. This is just one example of true old world European craftsmanship but it’s a particularly fine one and I’m very pleased to be able to share it with you all.